These days, 44 Pin Oak Crescent, Flemington is a cafe called Pepper, Tel +61 3 9372 2726. Back in the good old days it was known as Girdwood's Hygienic Library. Not a filthy, disease-ridden library where any old scum could poison the books with their nasty germs. But a nice, clean, private lending library where the books were fumigated with formalin between each read. I'm guessing Pepper smells much better than it did in the good old days. But you never know what you might catch off the communal newspapers. With quite a few glowing reviews under its belt, I was hoping for a top tier breakfast. The sweetcorn hotcakes, however, were no match for Mart 130 or Replete Providore. They were good enough, but nothing to rave about. 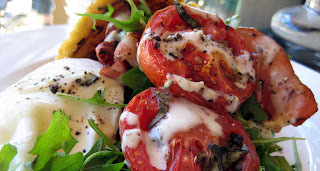 I quite liked the combination of crispy bacon, rocket, tomato and aioli. I was also impressed with the poached egg I ordered as a side. A nice, fresh, free range egg, poached pretty well. Other food options worth noting include the Breakfast of Champions (eggs, bacon, sausage, mushrooms, tomato and homemade beans on toast) and the Pepper's Breakfast (smoked salmon, homemade potato latkes, tomato, spinach and tomato relish). Service was a bit slow, but friendly, and the Monte coffee was good (for an extra 20 cents you can upgrade to an organic East Timorese brew). Weather permitting, they have a few tables on the street outside, where you can fumigate your lungs with Marlboro Lights. Harvey Nichols, 109-125 Knightsbridge, London, is the kind of place Patsy and Eddie loved to shop, and possibly drink. But it's unlikely Patsy ever ate at the Vth floor cafe, Tel +44 20 7823 1839. Which is a pity. 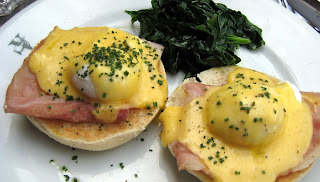 Because the eggs benedict at Harvey Nicks isn't too bad. Good quality eggs. Nice hollandaise. OK ham and muffins. Even the coffee was drinkable. I'm just sorry I didn't try the "Harvey Nichols Capuccino", which carried a curious warning... "contains nuts". If, like the fash-mag-slag, you prefer to take your nourishment in the form of boozy beverages, the Vth floor cafe does an interesting range of liquor hot chocolate. Some of these also contain nuts. The Vesuvio, for example, which contains a shot of Amaretto Luxuardo, and only costs 5 quid. Quite a bargain, when you consider that the Bloody Mary will set you back 9. It's all very well to say that breakfast is the only British food worth eating. But have you ever tried ordering eggs and bacon after 5pm? Fat chance. Unless, of course, you stumble upon Canteen, 2 Crispin Place, Spitalfields. Tel +44 845 686 1122. Day time... night time... it's always brekky time at Canteen. And not just any brekky. 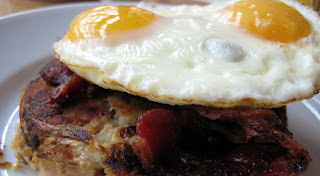 They serve a very fine bubble and squeak, topped with crispy bacon and two fried eggs. The bubble was a nice fat cake of mushy spuds and veggies, presumably leftovers from yesterday's roast. My main disappointment was the coffee, which was pale and weak and looked disturbingly like a cup of Thames. I did manage to drink it, so I'll give it one point for OK, but I think I'm being generous. It's no wonder people drink Starbucks in this city. Good coffee is about as common as a punctual train. 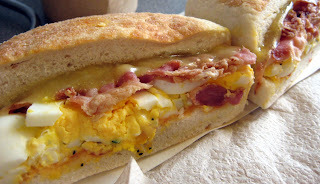 Little did I know that, as I tucked into this sausage and egg sarnie from Fuzzy's Grub, on the other side of the world Eddie McGuire was boning himself. Luckily, there were no bones in my bangers. Just meat, and the usual extenders they stuff them with. Tasty. Me: "A toasted sausage and egg sandwich on granary, please..."
Me: "And some HP sauce..."
Fuzzy: "Aaaaah... brown sauce... yes!" And so we were back on track... until further down the production line, when I'm asked if I would like some salt and pepper. At this point I used what I thought was international sign language for "a little bit" and made that gesture where you hold up your index finger very close to your thumb... the kind of gesture that can ruin a man's reputation in the bedroom... you know the one. Fuzzy then proceeded to drown my sandwich in a blizzard of salt and pepper, before asking me if it was OK. I think she may have seen the look of horror on my face. Me: "No, it's not OK, but it's too late now, so don't worry about it..."
And that was that. The sandwich was a bit spicy, but otherwise very good. Once you learn to speak Fuzzy's, it's easy to see why people keep coming back for more. All this "deliciously British" food is, according to the Roast spin doctors, designed to show that good old-fashioned British grub is more than a match for the muck they serve across the channel. 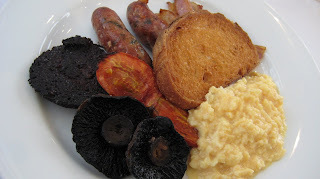 In reality, the only highlight of the Roast fry-up was the bangers, which were excellent (apparently they source their snags from a guy who was once "sausage-maker to the Queen"). The black pudding wasn't bad either. The rest was nothing special. Sloppy scrambled eggs. Crisp, greasy, fried bread (presumably stale bread). Streaky bacon and some veg. That Roast is more spin than substance should come as no surprise. The guy who started it was a PR flack before he got into the restaurant game. And spin is one of the defining traits of Blair's Britain. Perhaps substance will make a comeback under Gordon Brown? 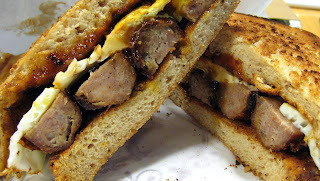 A splash of Brown sauce certainly adds spice to an otherwise dull breakfast. Other than the sausages, the best thing about Roast is the venue. It's light, open and airy, with big windows all round. Assuming it's not raining too hard, you can look across the river at the London skyline, or you can look down at Borough Market below. At £12, the "Full Borough" wasn't cheap. Far better value would be the two boiled eggs with Marmite soldiers, for £3.80. Or maybe the "Tattie scone with smoked streaky bacon, field mushrooms and a fried egg" at a mere £8.50. 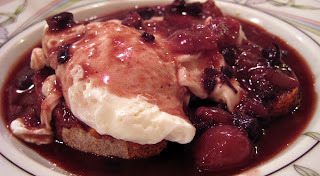 French breakfasts are typically carbs (bread, croissants, etc) and confiture (jam), with coffee or hot chocolate, of course. But sometimes you get lucky, and boiled eggs make an appearance. 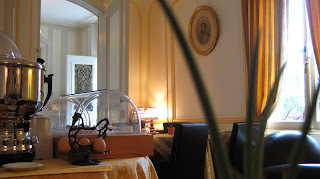 So we were very impressed with the breakfast spread at Hotel "Le Clos d'Amboise", 27 Rue Rabelais, Amboise, Tel +33 2 47 30 10 20. All the usual french stuff... plus ham and eggs. Very stylish little breakfast room, too.